Muscular tension, stress and fatigue can effect us all, wether we’re professional athletes, sunday cyclists or busy executives. Muscular problems are often caused by poor posture, too long sitting in front of computer screens, driving for hours or just plain stress. My deep tissue massage treatments will melt away tension and knots allowing you to feel easier in your muscles and bring greater sense of tranquility and balance to your body. When a muscle is tight or injured it is not performing at optimal efficiency. 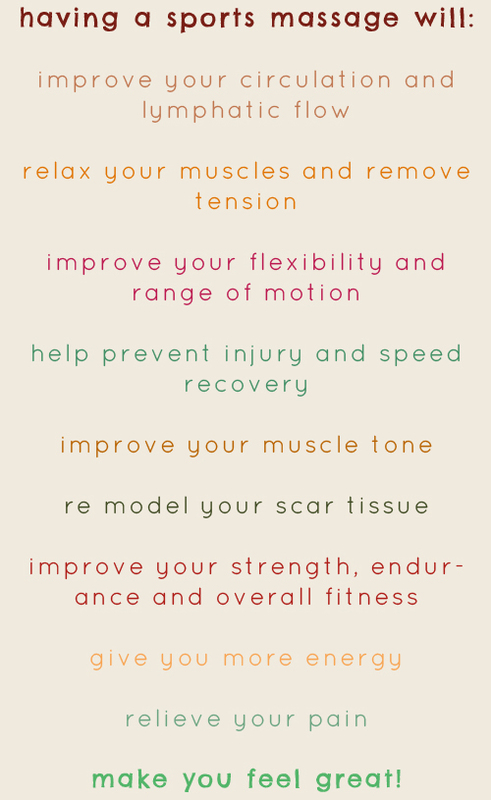 If you routinely push yourself to physical limits, you can benefit from a Deep Tissue Massage. If you are a sportsperson, massage can have an enormous impact on your performance; regular treatments can allow you to train to your full potential and recover to the best of your body’s ability. My treatments combine deep tissue massage techniques of sports massage with the use of acupressure points & meridian work. This ensures that not only will the tight knots in your muscles be ironed out, but that any stagnation in the energy pathways of the body will be cleared. The use of meridian focused massage will produce deep changes in the energy throughout the body helping to eliminate blockages or to enhance the energy flow in weak areas thus rebalancing the whole system. Leaving you feeling calm, energised and rejuvenated ready to face the world.